The book is divided into three parts: “Animal Fable”, “Animal Fantasy”, and “Animal Edens”. “Animal Fable”, pages 23 to 92, discusses the primitive beginnings of talking animal tales. Blount considers the animal fable as basically a cautionary or moral parable. Tales of animal revenge against humans for specific to abstract cruelties range from The Traveling Musicians to Alfred Hitchcock’s The Birds. Blount traces the evolution of the animal fable from rough, anonymous folk-tales to cultured literary updates (Charles Perrault’s Puss in Boots), and their artificial imitations by such authors as Hans Christian Andersen. Stories discussed or analyzed in detail include Joel Chandler Harris’ Afro-American tales of Brer Rabbit; the medieval Reynard the Fox fable, in particular as told by Chaucer (“Turn this story into Robin Hood, without any pretence of the hero being a ‘good’ character, and the feel is much the same.” – pg. 32); and 19th century editions of Aesop’s Fables as children’s books, with Christian morals overlaid. This leads Blount to original 18th and 19th century stories for children in which talking animals preach didactic moral lessons: Divine and Moral Songs for Children by Isaac Watt, 1715 (parodied in Alice’s Adventures in Wonderland), Tommy Trip’s History of Birds and Beasts by John Newberry, 1760, Life and Perambulations of a Mouse by Dorothy Kilner, 1783, Fabulous Histories Designed for the Instruction of Children, Respecting their treatment of Animals by Mrs. Trimmer, 1786 (“Mother Robin is rather a snob […]”, pg. 46), etc., etc. Blount traces these to both better-told late 19th century moral stories such as Anna Sewell’s Black Beauty, 1877, and to their 20th century equivalents. “Four Satires” examines Jonathan Swift’s Gulliver’s Travels, 1726, Karel ?apek’s Insect Play, 1923, George Orwell’s Animal Farm, 1945, and Erich Kästner’s The Animals’ Conference, 1955. 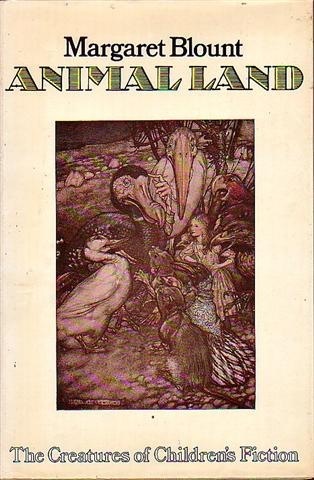 This is followed by “People With Heads”, some stories with, or illustrated with, humans with animal heads; though Blount’s examples also include some fantasy animals such as Carroll’s Cheshire Cat and White Rabbit. These range from The Headlong Career and Woful Ending of Precocious Piggy by Thomas Hood, 1859, to the later 19th century works of Edward Lear and Lewis Carroll, the animal-headed protagonists of British 20th century children’s magazines such as the Bruin Boys and Rupert Bear, Don Marquis’ Archy the cockroach, and Walt Disney’s classic anthropomorphic stars. To list everything that Margaret Blount covers would make an extremely long review. Just a few other highlights are Beatrix Potter’s many animal books, Rudyard Kipling’s Jungle Book tales and his Thy Servant, a Dog, Michael Bond’s Paddington Bear series, E. B. White’s Stuart Little and Charlotte’s Web, Jean de Brunhoff’s Babar the Elephant, Ernest Thompson Seton and “the humanized ‘Nature’ story”, Dodie Smith’s The Hundred and One Dalmatians, Tove Jansson’s Moomintroll series, Maurice Sendak’s Where the Wild Things Are, and “Fallen and Redeemed: Animals in the novels of C. S. Lewis”. For every novel or series that Blount devotes several pages to, there are dozens of others briefly mentioned in less than a page. 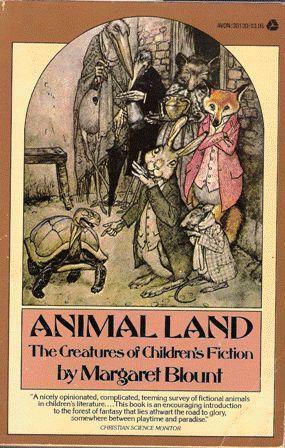 Animal Land contains over fifty illustrations taken from these stories; some classics such as John Tenniel’s Alice’s Adventures in Wonderland and Pauline Baynes’ Narnian illustrations, and many unknown that will delight talking animal fans. Since this is a scholarly study, there are a bibliography and an index. 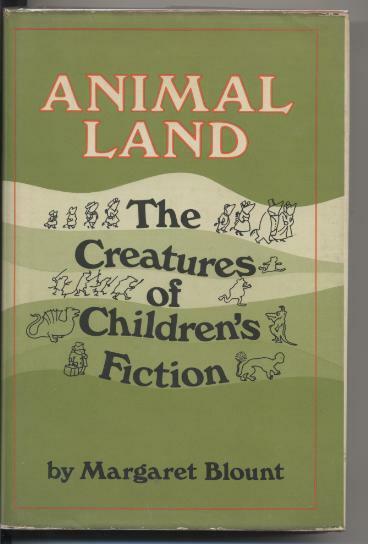 If you want to read a book about talking animals, rather than fiction starring them, and an excellent comprehensive survey of the genre (though a bit Anglocentric), Animal Land is definitely the place to start. WOW. I must get hold of this. Thank you! Still have my copy of this book that I got years ago based on your write up about in Yarf! A great read for anyone who wants to know the origins of the artwork & stories that inspired furry.